You know that fun is at the heart of the platform. As much as we want players to improve their programming skills, we want them to have fun doing so. 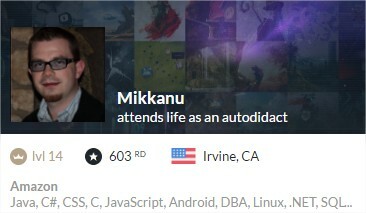 We've discussed with Mikkanu from Illinois in the US and he agreed to share his experience on AI programming for fun. Mikkanu: I've been programming one way or another for more than 20 years. I've started on a Commodore with a BASIC interpreter. Now I work with big data for Amazon AWS. A few years ago I ran a start-up company with a focus on helping less software-oriented companies. Programming is for me both a job and a hobby. I enjoy spending my free time on platforms like CodinGame, HackerRank, or answering questions on StackOverflow because it's fun and it helps me flex muscles I don't get to use in my day to day work. CG: You've tried AI games on CodinGame, how was your experience? Mikkanu: I've had a great experience on CodinGame - right from the beginning. I think the first game I played was the drone multi-player game and then Tron. And after that it was likely the Terminator single player game. It was not my first time trying AI programming. Before starting my professional career I spent a few years working on games. But that was many years ago and since then I recall having tried some platforms such as .NET Terrarium (around 2004) and Fighting Code but those other platforms didn't captivate my attention. CG: To what extend did playing AI games on CodinGame help you improve your bot programming skills? Mikkanu: Playing games on CG is not just fun. It's helped me keep my skills sharp working with graphs and trees. Building and traversing graphs is a pretty much required skill to solve most of the CG games. Path finding algorithms like BFS, DFS, A* search or Dijkstra are also very useful. I can't say that I've learned new algorithms from other players on CG but I've definitely sharpened my skills and yes, I've benefited from studying strategies of other players on multi-player games. As a professional with a family I wish I had more time to dedicate to multi-player games, that's why I particularly enjoyed solo contests. CG: What kind of tips would you give to beginners in AI who hesitate to try? Mikkanu: I've actually encouraged a few of my beginner friends to get in on CodinGame. My advise is to dive right in and give it a shot. I think the practice area is a pretty good way to get started but I also feel that it was better before when one could study other players' code if one got stuck. I would recommend submitting code often. That is one mistake that people tend to make, especially with multi-player contests in my opinion. I think the sooner you get your code submitted, the sooner you can find out how you're doing and then try to improve your solution. CodinGame has had a lot of appeal to me because of the solo contests and because of the built-in online platform to write/debug and submit the code. I think it has a lot of potential. CG: Thank you for the kind words and for your time Mikkanu! what is the difference between Algorithm and AI ? I think Algorithm are the "tools" and if you combine some of them to solve not just a single task, but aim for more complex different tasks its getting more and more AI ... but we are still talking about an Expert-System AI not a "real AI". Its not sure if "real AI" can be developed.